Should there be a base amount of cash given to all? Analysis Philosophers, economists and other academics have long discussed the idea of “basic income” – an unconditional monthly check from the government to every citizen, in an amount at least high enough to cover all basic necessities. Recently, this idea has gained more political traction: Even conservative parties consider it, and government-initiated trials are running or about to start in Finland, the Netherlands, Canada, and potentially elsewhere. One reason this idea has caught politicians’ attention is the fear that large-scale automation will soon put many people out of work permanently, even as economic growth continues. (Truck and taxi drivers are currently the most discussed example.) Basic income is seen as a solution to the social problems that the predicted “technological umemployment” will bring. But with less and less work to do, this system comes to resemble a twisted game of musical chairs: In the future, it will be mathematically impossible for everyone who wants a job to find one. We can therefore no longer deny income to those who don’t work. This might be called the “Automation Argument” for basic income. The Automation Argument is extremely popular; countless contemporary newspaper and blog articles take it as a premise. But the Automation Argument is false, and it impedes meaningful economic change. Neither does the Automation Argument advocate fundamental economic reforms. It justifies basic income by the need to cushion the effects of automation, and that is the same reason we give for today’s conditional welfare payments: The checks are a charity toward those who cannot work. So even if automation did cause widespread and permanent unemployment, a basic income for those affected would not be progressive or emancipatory. The premise that automation will make human work superfluous flies in the face of all historical evidence. (Economists refer to it as the “Luddite Fallacy.”) The dream that machines will some day do most work for us is almost as old as mankind. Since the early 20th century, that dream has seemed within reach, and predictions of the end of work abound. In 1930, British economist John Maynard Keynes famously predicted that, within 100 years, only 15 hours of work per week would be needed to satisfy one’s “absolute needs.” In 1980, French philosopher André Gorz suggested a policy that would have increased free time for workers at the pace at which computers were then expected to increase workers’ productivity: from a 40-hour work-week to a 35-hour week over the first four years, to 30.5 hours at the end of year eight, and so on. That is a political choice a society can make. As of yet, however, we have always chosen the opposite: Capitalist societies keep work-hours constant and increase production. Our exemplary worker continues to work an eight-hour day, but is now expected to produce 200 pairs of shoes during that day (and usually at the same wage). As the tele-teacher in Douglas Adams’ “Hitchhiker’s Guide to the Galaxy” aptly explains: Until we reach the “Shoe Event Horizon,” we will simply produce ever more shoes. Take the example of the U.S.: Work productivity – that is, the value produced per work-hour – has quintupled since 1947. On average, every hour that Americans work today yields five times as many (or as valuable) products as an hour worked by their grandparents. At the same time, however, work-hours per person did not decline. Certainly, the past is not always a guide to the future. Some argue that this time it’s different because we will soon have artificial intelligence, so robots could take over even high-skill jobs. But it is unclear why that should make a principle difference if we keep our economic system: The principle of production increase over leisure increase applies independently of the type of job in question. There is a further reason to be critical of the Automation Argument for basic income. At first sight, this argument sounds revolutionary because we no longer need to do anything to deserve income. Let’s face it, the argument says, technological development forces us to overhaul some moral beliefs near and dear to us, such as: “If any will not work, neither let him eat.” These beliefs might have been reasonable for most of human existence, the Automation Argument concedes. But in a situation where we lack enough tasks to be carried out, it becomes cynical to consider people who don’t work free riders. People who live off government transfers like welfare checks even though they could work are widely regarded as free riders. These people live off our work, and if that’s not exploitation, then what is? There is no similar public grudge against people who live off our work by other means: by living off dividends and of government transfers like tax exemptions. While welfare recipients form the bottom of our social hierarchy, the idle rich are even admired. Work is widely considered a burden, and income is seen as its deserved compensation. In reality, however, there is no correlation between how burdensome and how well-compensated a job is – otherwise, construction workers, cleaners and prostitutes would top the pay scale. An increase in productivity legally belongs to the owner of the new technology, and few of us seem to mind that. 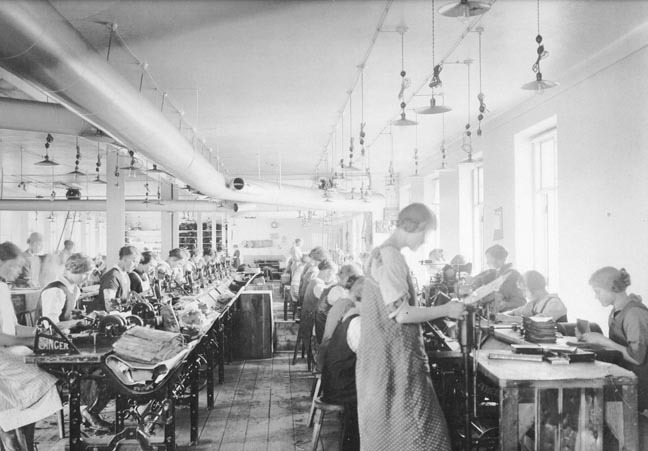 In the example of the shoe factory, production doubled. The worker neither got more time off as a result, nor higher pay: The factory owner got more shoes to sell. The income it advocates is unconditional, but it is justified in the same way as today’s conditional welfare checks: It is a charity toward those who cannot work and have no capital. Everybody else will continue to work and be paid in the same way that they are today. Those of us who still have a job will collect basic income in addition to our current salaries (a gain partly annulled by the taxes paid to fund basic income). But there will be no fundamental reform of the economy. Those of us who are laid off are not entitled to any of the gains that the new technology produces. The owner of the new technology alone is entitled to its proceeds, while all of our fellow citizens are now responsible to pay for our living (through taxes that fund basic income).